At KKH, all the doc did was feed him pandol and his temp dropped and we were asked to go home. Hmmmm... waste of $$$ but in exchange is my relief. Ernest's fever is like a roller coaster, going up and down througout weeks. MIL and me suspect it is the school, as the room where they study and play is very cold. Finally, the doc in KKH decided to give Ernest a stronger antibiotic and this week, I hope to say to kiss this terrible fever episode goodbye. Get well soon, Ernest! Mummy needs her beauty rest. I have not blogged for a long time to take note of bb's development. Need to pen down all so next time as a memory. Jan 2010 : Nothing amusing as I could recall. Feb 2010 : Baby took 2 raw eggs and ran off despite MIL's warning. And luckily when he returned it, the 2 raw eggs are intact. Mar 2010: Baby enrolled into the playgroup at MIL's place. He loves it. MIL's comments are, the two of them entered the school without looking back. Apr 2010 : Bb's birthday, had a fun day with daddy and mummy jus shopping and makan-ing. This above photo shows the days we spent at the end of 2009 and the start of 2010. It has been a long time since I post... 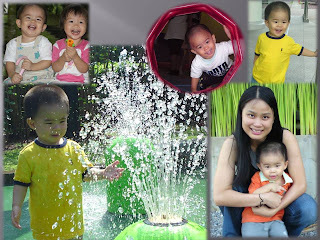 Very busy with work and with both JY and me busy adjusting to a growing toddler. My precious is 22 months this month, and soon he will turn 2 years old. It was just like yesterday when he was jus an infant in my arms to a running toddler with endless energy. 2) Has a mind of his own, and boy... when he says no, means NO. 3) Has a GREAT appetite, MIL is complaining he eats ALL the time. 4) Has less resistance to strangers, plays and talk to uncles and aunties in the bus. 5) Getting real heavy and my arms are breaking, our guess is 14kg. 6) Able to express his emotion via actions, when I went to HK and didn't see him for 2 weeks, the first thing he did when he saw me, was to hug and cling on to me. Guess tt's his way to let me know tt I shouldn't be away from him for sooooooo long. Looking forward everyday to see his smile and the things he does, which never fails to surprise me. Yesterday went for MMR jab. My boy is growing. 4) Knows how to mimic others.